This boardwalk hostel boasts beach access on the cheap for travelers who don’t mind sharing a room. Unique details like group outings, graffiti art and stellar ocean views make for an authentic, exciting SoCal vacation on a budget. In recent years, Venice has undergone a major change—on a stroll through the canals, you’re now as likely to find juice bars are you are head shops, and even the delightfully seedy boardwalk is home to a few fancy brunch spots. That being said, Venice hasn’t lost its weirdness entirely. Beach bum vibes are integral to the neighborhood’s charm, and Samesun is an inviting throwback to the hang-loose days of yore. 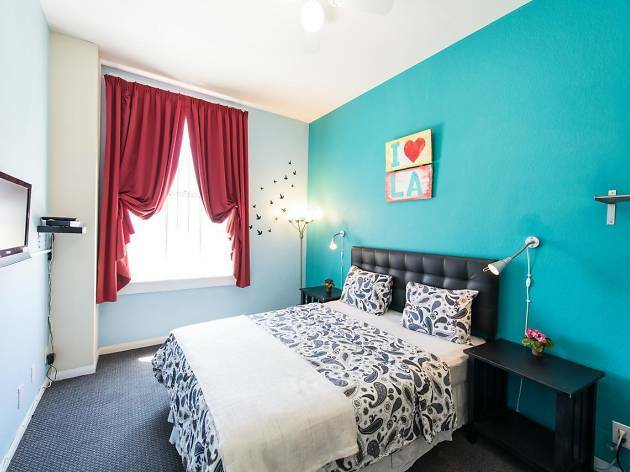 L.A.’s only oceanfront hostel is decked out in bright murals and shares real estate with a surfboard rental shop, a dive bar and a henna tattoo tent; inside, you’ll find a brightly decorated community space where hostel employees mark activities like volleyball games and karaoke on a constantly updated activity calendar for travelers looking to kill time and make friends. Samesun offers both private and group rooms; the latter sleep groups of four or eight. 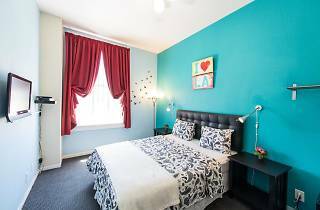 Private rooms come with TVs and mini fridges, and, for a few bucks more, a private washroom, while dorm-style group rooms are outfitted with bunk beds and lockers and are close to shared bathrooms. Whether private or shared, most rooms offer stellar views of the Pacific; take a break between the beach and the bar to enjoy sunset from the common room with all your new pals. Location: Venice’s weirdos now share the neighborhood with the likes of Google and Buzzfeed, which means there’s a satisfying mix of upscale and low-key food, shopping and nightlife. The main attraction is the beach, which happens to sit across the street from the Samesun. If you want to venture further into L.A., busses, Ubers and Santa Monica’s metro station are close at hand. Venice Beach Boardwalk: This sunny stretch of sand is dotted with shopping, snacks and prime people watching. Rent skates, grab a corndog or pick up souvenirs in this kitschy beachside marketplace that seems delightfully stuck in the early ‘90s. Cafe Collage: This long-standing Windward Avenue cafe offers smoothie and lunch fare in addition to coffee and tea, but it’s standout attribute is its location. Tucked just off the boardwalk, the cafe is a haven from the crowds, while its many window seats still provide unparalleled people watching. Venice Canals: Venice is naturally named for the famed aquatic Italian city, and visitors may be surprised to discover that the neighborhood has its own set of canals. On an afternoon stroll, you’ll take in rows of ducklings, lush foliage and well-appointed beach cottages. Abbot Kinney: Don’t pass up an opportunity to explore Abbot Kinney, a posh boulevard of designer shopping and buzzy new restaurants. If your stay falls on the first Friday of the month, Abbot Kinney turns into a mile-long block party complete with art, music and some of L.A.’s finest food trucks. Good for: As with most hostels, Samesun’s no-frills communal atmosphere is best appreciated by younger, low-maintenance and budget-conscious adventurers. Because of its activities calendar and communal feel, Samesun is an especially good choice if you’re traveling solo; you’re guaranteed to meet some interesting people, and maybe even find your next travel partner. Time Out tip: Every Friday night, Samesun offers a limo tour of Hollywood’s biggest clubs. It’s a little hokey, but it’s a cheap way to experience L.A. nightlife (sans Uber surge pricing). Plus, there’s no better way to get to know your cute bunkmate.